When someone promises 4G speed reaching up to 135Mbps, in an internet-scarce country like India, the market can only go crazy. And so it did after September 5, when Reliance made the Jio SIM available to public under Welcome Offer. The situation has changed in the last one month. 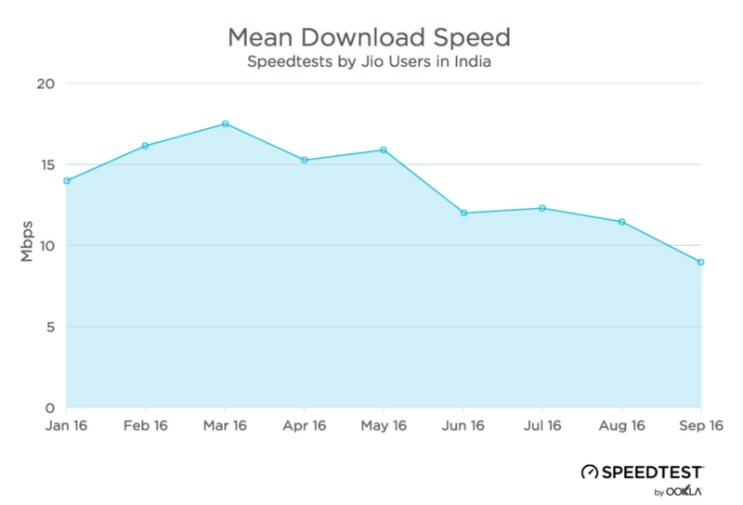 Numbers by Ookla, the company behind world’s most popular speed test app, show that the Jio speed is down significantly compared to how it was earlier. Although, don’t count out Jio yet. The same report by Ookla also says that despite its imperfections Jio is actually a big deal and has changed the 4G market in India. Ookla has recently released a report based on speed tests done in India since the launch of Reliance Jio. The report shows an exponential increase in 4G users across India. Since these numbers are based on people using Ookla’s Speedtest app the real number should be higher. According to Reliance Jio, it has registered over 1.6 crore customers in Welcome Offer, which doesn’t include users who registered before September 5. 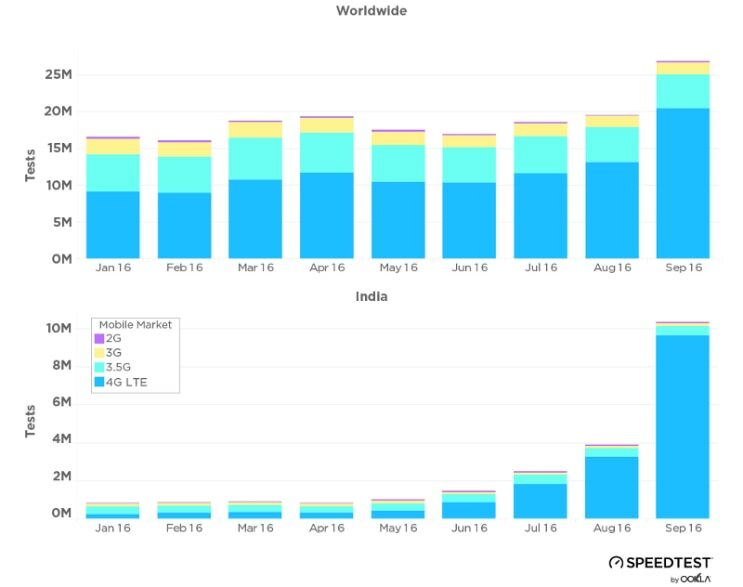 A graphic presentation by Ookla shows a continuous increase in 4G speed tests in first nine months of 2016. These tests are conducted across all the networks providing 4G services. In January, only 97,630 people used the app to test 4G speed. In August the number was 2,742,413, and took a massive jump to 8, 214,512 in September 2016, the month when Reliance Jio became more widely available. The metrics company has also presented a graph showing, first a gradual increase in 4G speed tests and then a sudden jump in September. The following graph shows Reliance Jio users in the blue colour and rest of the 4G users with purple colour. By August 16, the number of people testing 4G speed stands at somewhere around 8 million across country. Out of these 8 million people are shown to be using Reliance Jio. Then in the next one month, on Sept 16, the number of Reliance Jio tester jumps to over 21 million, which is about 5 million more than the officially recorded number of Welcome Offer users. But what about the promised speed? As we have seen, and continue to do so, queues of people outside Reliance Digital store, the popularity of Jio was never in doubt, what is up for question is the speed promised by Reliance Jio. Users have continuously moaned and groaned about the falling speed but now since we have the numbers released by Ookla, we can confirm their groans are not fake. The struggle is real. The data released by Ookla shows that mean download speeds for 4G capable phones dropped 23 per cent month-over-month. In September alone the mean download speed has fallen from 11.31 Mbps to 8.77 Mbps. It should be noted that while the mean download speed is still 8.77Mbps, according to Ookla, it doesn’t mean most users are getting the speed. In our experience we have registered speed as low as 0.5Mbps and also as high as 25Mbps. Reliance Jio users have also complained of abysmal speed on the network. Good speed or not Reliance Jio has definitely managed to make its mark not just in India but globally as well. The 4G surge has been so powerful that the global data has also been affected. Take a look at this graphs. 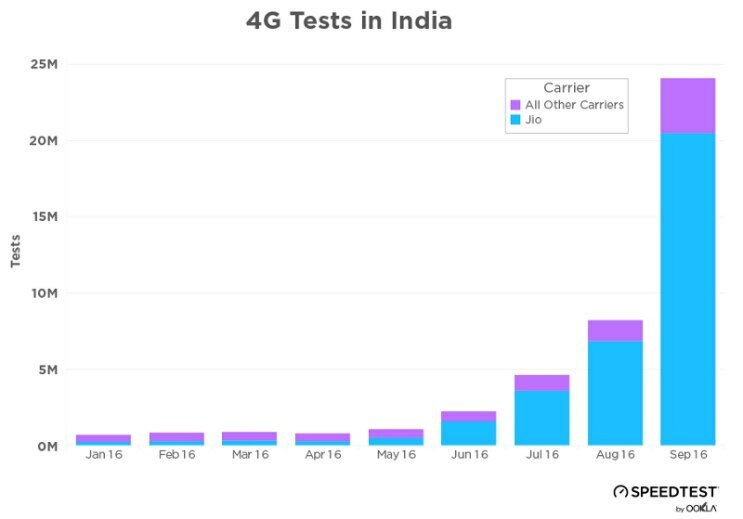 The graph shows that global 4G test stayed at around 10 million throughout the year and from Aug 16 to Sept 16 the company recorded a jump to more than 20 million tests on 4G LTE networks. Reliance Jio’s interesting strategy of free SIM, free internet, free voice calls and free SMS has gathered plenty of steam in last few months. It would be more interesting to see how Indian customer reacts once the services are not free, which is from January 1, 2017. Reliance has managed to improve its call quality in the last one month, if it can also work on the speed it could be the moment Indian telecom market changes for good.